Whether you’re brand new to car sales or been around for a couple of decades, today’s prospects pose a unique challenge to those using traditional vehicle-selling methods. Specifically, the buyers have evolved… but, unfortunately, the average road-to-the-sale has not. Ten years ago, actual new car prices were near impossible to find online and used cars were priced well above their expected selling price. The online shopper in 2008 was really no different than the newspaper shopper from 1998 – that is, they both showed up on your lot with more questions than answers. Back then, if you wanted to close your Ups at an acceptable rate, you had take buyers down a four-hour road-to-the-sale complete with a full needs analysis, lots of qualifying and an often-time-consuming product selection. You would then demonstrate an award-winning feature presentation that was loaded with your best FAB statements before they ever got behind the wheel for the demo drive. As just one of the many valuable lessons you’ll learn in Assumptive Selling, today’s Up – whether on the lot or on the phone – has already done their own needs analysis, their own qualifying, their own product selection and their own feature presentation. They found value and relevancy in your vehicle and now they just want to find an easy way to buy it! In fact, they’re virtually all arriving on your lot ready to test drive, yet most dealers still only get about half their Ups behind the wheel! Why is that? It’s because your old-school methods are making today’s Ups question why they ever even considered shopping for a car in the first place. Of course, it’s not your fault. Sales training materials for today’s sellers haven’t been updated in decades. That is, until Assumptive Selling was written. If you truly want to learn how to sell more cars for more money, then be prepared to pay big bucks for the best car selling book ever written for converting today’s buyers. At $49.99 on Amazon, Assumptive Selling: The Complete Guide to Selling More Vehicles for More Money to Today’s Connected Customers ain’t cheap – especially when you compare it to the sales books you can buy on there for under ten bucks. Well… you get what you pay for. This is the best car sales book ever written… and I know it’s the best, because I wrote it. I’ve served in sales leadership roles for more than 30 years and I’ve closely studied, trained, coached and mentored successful sellers throughout my career. Today, the automotive salespeople employing the lessons from Assumptive Selling are routinely closing 25-35 deals every month. Moreover, their deals are the highest grossing in their respective dealerships and they enjoy perfect CSI! Additionally, they can complete most of their deals in under 60 minutes, which gives them more time to help more Ups! All because they (and sometimes their managers) use the methods, word tracks and strategies taught in Assumptive Selling! A Book for Everyone on the Sales Team! 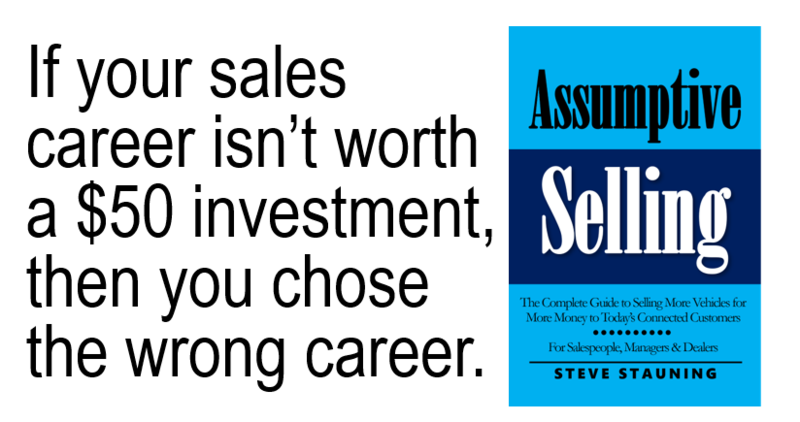 While this is a must-read for every new salesman and saleswoman in automotive (or RVs, Powersports, or boats), it also contains important lessons for sales managers, general managers, dealer group executives and owners. There are eleven more chapters filled with everything you need to know to start driving some of your own Ups into the dealership, while also closing your existing opportunities at twice the current rate. You’ll do this because you’ll understand the connected customer better and start treating everyone like a qualified buyer who wants to buy today… from you. Dealers, Groups, OEMs and Industry Vendors wishing to purchase in bulk (20 or more copies) should contact me via the methods offered here with their order. The price is $29 per copy, delivered, when you order 20 or more copies; $39 per copy, delivered, when you order 10-19 copies. Thank you for writing the perfect book. I’ve been watching your free videos for years and you help me go from 10 units a month to a consistent 25 plus. Anyway, I bought your book when it came out and read it during every free minute I had for a week. In that time I used your process to get 100 percent of my ups to take the demo drive and I doubled my close percent. Your book gave me at least 3 extra units this week and I know I’ll break 40 units in August. You rock Steve! Thank you 1000 times over.